I took this image at sunset on a stormy day in Canada’s northern territory of Nunavut, in the Canadian Arctic. On that huge expanse of barren flatland, most houses are built on short stilts because of permafrost that makes it virtually impossible to dig deep enough to lay a proper foundation. The vast majority of the about 31,000 people living in Nunavut are Inuit (about 26,000 or 85%). Inuit are one of the three groups of Aboriginal people who live in the Canadian Arctic (the other two groups being First Nations and Métis): Inuit speak a language called Inuktitut (Nunavut and Inuit are two Inuktitut words respectively meaning “our land” and “the people“) and some of them also speak English. If you venture out of the just 26 communities where most of Nunavut’s Inuit live in that immense territory of almost 2 million square kilometers (about 772,000 sqm), it is not unusual to see isolated cabins such as the one in the image above that Inuit use mostly as a base for hunting. That day, when I realized that the setting sun was about to briefly peek out of the thick stormy cloud cover, I quickly set up my camera and tripod and framed that dramatic sunset using the winding dirt road created by the wheels of the there ubiquitous quads as an element of the composition leading to the cabin that I placed in one of the rule of thirds “power points” to add an element of interest to what would otherwise have been a flat, static composition. 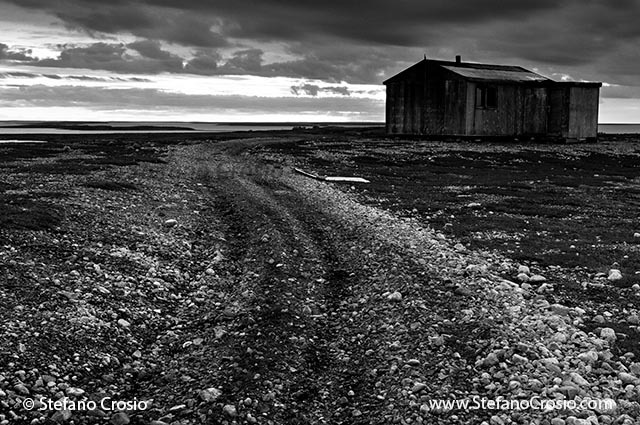 This entry was posted in Photography and tagged black and white, cabin, Canada, Nunavut, photography, sunset on April 18, 2013 by Stefano.